Digital transformation is the latest term for the application of technology in your business. Usually this relates to improving the customer experience and/or driving down operating costs by automating processes and commoditising products and services. Every type of business uses technology differently, but there are some core tools that can be applied effectively in almost any type of business. One such application is for the automation of documents. Whilst Document Management Systems (also known as ECM or enterprise content management) have been around for many years, they are now capable of being used to manage all types of records, such as images of paper documents, electronic forms, emails and media files. Workflow, or business process management, will enable you to automate work processes and integrate your existing database systems with your document management system. Electronic forms will enable you to replace document based forms and checklists with web forms that collect core data as the forms get completed. Digital signatures can be the final piece of the digital workflow that enables paper to be removed completely from your processes, avoiding the need to print, sign and scan a form. You can see this in action at two workshops in the Channel Islands on Tuesday 18th October in Guernsey and Wednesday 19th October in Jersey. I’ll be joining, Isle of Man based, MBS as they demonstrate the Laserfiche product suite. 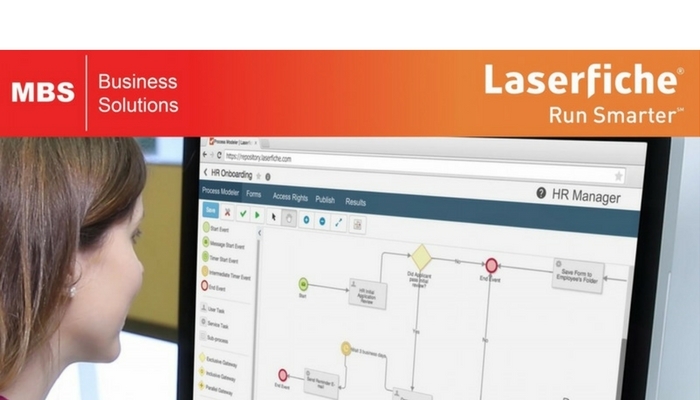 Laserfiche is a powerful document management system, with workflow and forms software. MBS have successfully integrated Laserfiche with DocuSign digital signatures. I’ll be providing advice on how to go about starting a process improvement project and defining the principles that should be applied. This is a free event and open to Channel Island based businesses who are interested in accelerating their digital transformation through the use of workflow and forms technologies. >>> To find out more about the event and register please click here. If you are unable to make the workshops, but would like to know more information about Laserfiche please contact me to arrange an appointment.